As we learned on Tuesday night, the 2020 GMC Sierra HD is significantly less ugly than its fraternal twin at Chevrolet, the 2020 Silverado HD, and has more cameras on board than a crowd at a Justin Timberlake concert. The cameras are fancy, too, with one letting a driver see right through whatever they’re hauling. The new Sierra HD and its turbo-diesel trim’s 910 lb-ft of torque can tow “well in excess of 30,000 pounds,” according to GMC, which hasn’t released official numbers yet. 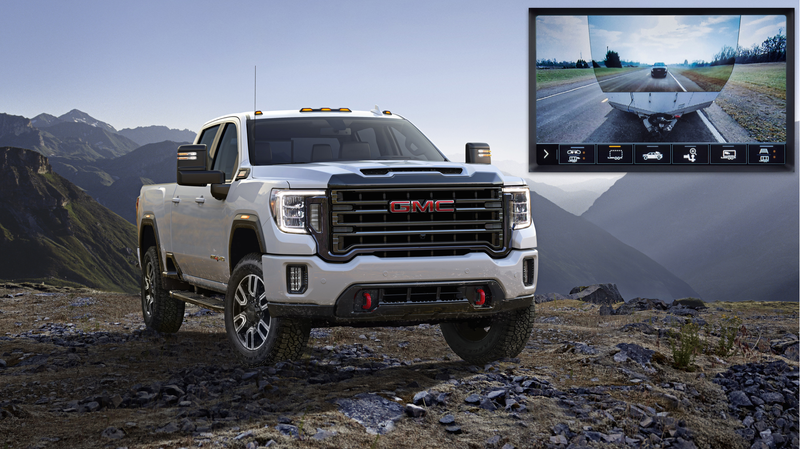 That means the truck can have a whopper of a trailer in tow, and GMC obviously wants drivers to be able to see that thing from every angle—the HD will have 15 camera views, including the “invisible” trailer one. The trailer camera doesn’t actually make it invisible, of course, because that would be too cool and we as a human population aren’t worthy of it. It’s just a big optical illusion, showing up with an angle from a trailer-mounted camera placed inside of a tailgate-mounted view. It’s pretty cool looking, even if—much like all of our overly filtered Instagram photos from six years ago—the colors don’t totally match up. GMC calls the “transparent” trailer view an industry first, and says it can help while driving around parking lots, merging into traffic and making tight turns. Some of the other 14 cameras include top-down and side shots, angles of the truck bed and camera view that can be mounted inside of whatever’s hooked up to the truck, in case you need to check and see that, yes, there’s a still random sink in the middle of your trailer, facing the wrong way and blocking the entire walking area. You just never know when that kind of thing might change. Chevy hasn’t said much about its version of the Sierra, the new Silverado HD—short for “heavy duty,” not “hideous, dude”—yet, since it’s supposed to fully debut in February. The Silverado usually has less tech than the Sierra, but, if it has anywhere close to the amount of camera views as this truck does, we can only think good thoughts for its future drivers. What a dreadful sight to potentially have to behold from 15 different angles. May the Silverado HD have mercy on us all. What Do You Want to Know About the New Suzuki Jimny?